Make customer engagement work your way. Providing a personalised customer experience through a tailored solution delivered with the simplicity of the cloud. Sophisticated Contact. Cloud Simplicity. Global. PureEngage is a fully featured customisable contact centre solution for organisations with 50-1000 seats or more sophisticated requirements that want to engage customers across multiple channels and multiple locations if required. It provides full visibility and control across all interactions, agents and channels along with analytics and reporting to help predict trends, manage workloads more efficiently and enrich customer experiences. Intelligent routing integrated with IVR and your CRM platforms offer full visibility across channels. You can maximise first contact resolution while providing a memorable customer experience. You can also improve online sales conversions and increase cross-sell revenue from existing customers. Use real-time monitoring, analytics and reporting to react fast to trends. Optimise operations to improve staff performance and satisfaction. And help reduce costs. Now you can take advantage of new contact channels and features without major capital cost or management complications. Easily scale to match demand fluctuations. And keep your investment in phone and CRM systems safe. Is Genesys PureEngage for you? Deliver a more intimate customer experience with a full contact history across all channels. Use analytics to predict customer needs and proactively take action. Unified dashboards reduce the inefficiency of different applications for different channels. Identify delays or customer frustration and immediately take action to resolve issues. Design your own self-service IVR applications with an easy to use web tool. The core cloud technology is pre-configured and tested for fast deployment. Design features to suit your needs. Replace capital outlays and ongoing upgrade costs with a predictable operating expense. PureEngage provides omni-channel capabilities hosted in the cloud. We work closely with you to design a solution that fits your specific requirements. Deployment is to a defined scope and timeframe with minimal disruption to business. Agents and supervisors can connect via landline phone and internet, or through integration with dedicated Telstra SIP and Telstra IP network services. What features and deployment models are PCI DSS compliant? Assurance of highly reliable operations through 99.95% target availability. One simple price includes all calling costs from inbound to agent desktop, and outbound for agent transfers. Costs are based on a monthly, price per user license for a 24, 36, 48 or 60 month term, with the ability to burst capacity on demand. One queue - move between channels during an interaction. One point of administration across channels. Cloud based. Voice, touch phone, text to speech. Screen-pop, plus full call control functions. See queues, response times, types of queries and more. Schedule a call-back from an agent. Create and modify customer engagement applications. You must use Telstra Inbound Services (1800/1300/13 numbers) for the delivery of inbound calls. A minimum of five contact centre seats is required. 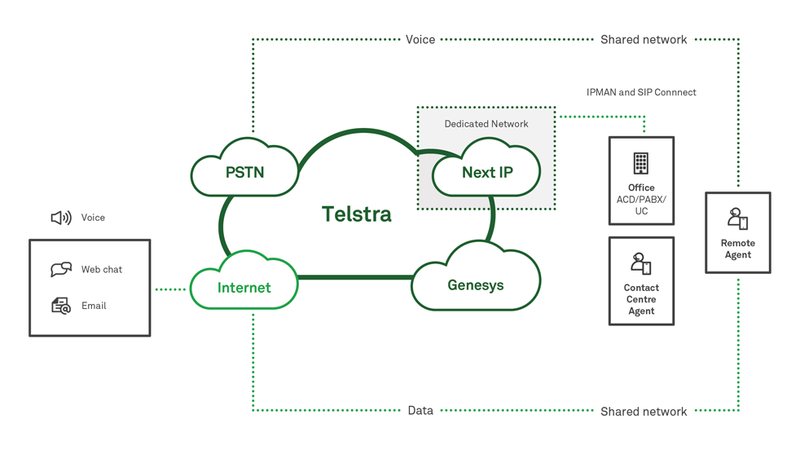 Private network access must be via a Telstra Next IP® network service (managed or unmanaged). Private network costs are additional to PureEngage costs.